Facebook is a powerful tool for small businesses. Potential customers can use it as a search engine to find businesses and service providers in their area. People can research companies, beyond just their about page on their website. As a lawn maintenance business, it is important to have a great online presence. A well put together Facebook page can be a lead generator for your business and can help serve as an important piece of your marketing mix. Many lawn maintenance businesses aren’t doing social media right if at all. There are businesses that will sign up for a social media account, post for a week or two and then give up with their efforts. There are others that post irrelevant posts to their industry and really don’t have a strategy to what they’re doing on Facebook, Twitter and other social media accounts. 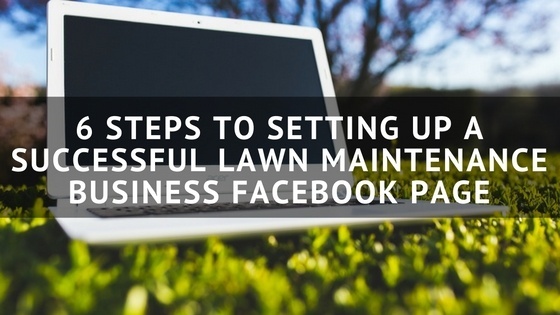 So what goes into creating a great Facebook account for lawn maintenance businesses? Here are the 6 steps that you should follow in order to set up an awesome Facebook page. Make sure that your name, address and phone number (or NAP) are accurate and consistent across all of your listings. Be sure to use your regular phone number that your business uses to field calls. Complete your business category and ensure that you have your business hours set up correctly as well. Write a short description about your business, such as your tagline and complete all the fields that are applicable to your business. Facebook has actually said that verifying your page will lead to higher credibility in your listing and also in how well you rank in Facebook searches. If you go into your settings, you can click verify page and it will call the business number you listed. They will then give you a verification pin number that you will enter and then your page will be verified with a nice, local business verification check mark. It means that you’ve staked your claim and you are actually in charge of the Facebook page they are on. As a lawn maintenance business, you most likely will want to choose a button that will encourage the people visiting your Facebook page to call or contact you. A “call now” button will actually enable mobile users to click the call now function to call you right out of Facebook. The “call now” function will also track calls, so it is a great way of learning how many calls you actually receive from Facebook leads. Facebook is a highly visual platform. It is important for you to have a great profile picture. They’re a 180x180 pixels, so make sure you choose an image that works well as a square and that it looks good when it gets resized. Many businesses use a simple logo, which often is the most prefered. When you’re out in the field, snap pictures using your smartphone and share them. Here is a guide that we created earlier this year that has some tips for taking great photos using just your phone. Facebook is a great platform to have your best customers engage with you. It gives you the ability to have customers share their experiences with your business and potential customers to see and hear about their positive interactions. You should make an effort to encourage reviews. Ask in your regular, transactional emails and you can even ask on Facebook and other social media outlets. Social media is a long term play. You need to be consistent about how often you post. It isn’t advantageous for you to actively post for a couple of weeks and then let your page go dark. In order to be consistent, you should work on building up a repository of posts and utilize either the native Facebook platform to schedule posts or a scheduling tool, like Hootsuite. Want to improve your lawn maintenance business even more? Learn more about how FieldCentral can help you ramp up your business.